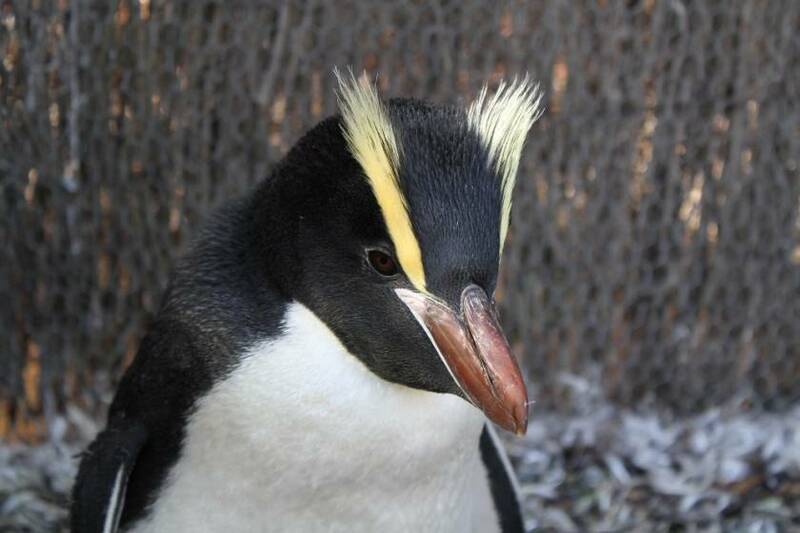 The most timid of the crested penguins, the Fiordland crested penguin stands about 40cm and weighs around 4 kilograms. The head, throat and upperparts are black and underparts are white. The sulphur-yellow crest starts at the base of the base of the bill, extends over the eye and droops down the back of the head. Adults often have white stripes on the cheeks, juveiles have a shorter crest and pale cheeks. 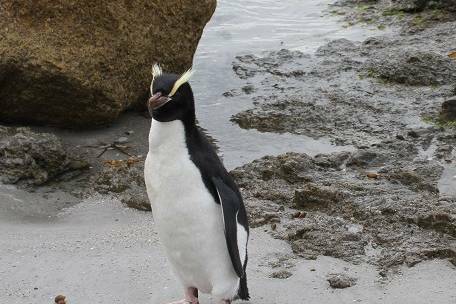 Fiordland crested penguins breed in the rainforests along the rugged coastline of New Zealand's Fiordland and Stewart Island. They nest individually, or in loose colonies, close to the coast. Nest sites are in caves, under overhangs, at the base of trees or in dense vegetation. The males return to the breeding sites in June (mid winter), usually to the site of last year's nest. The female follows shortly after and two eggs are laid in July. The second egg hatches first, while most first eggs fail to hatch. If both chicks hatch, the smaller first-egg chick is unable to compete for food and usually dies. For the first few weeks of life, the chick is guarded by the male and fed by the female. After this both parents feed the chick and the chick wanders, creching with other chicks if they are nearby, but returning to the nest to be fed. Chicks fledge in November, when they are 10 weeks old. They return to their home colony to breeed at around 5 years of age. 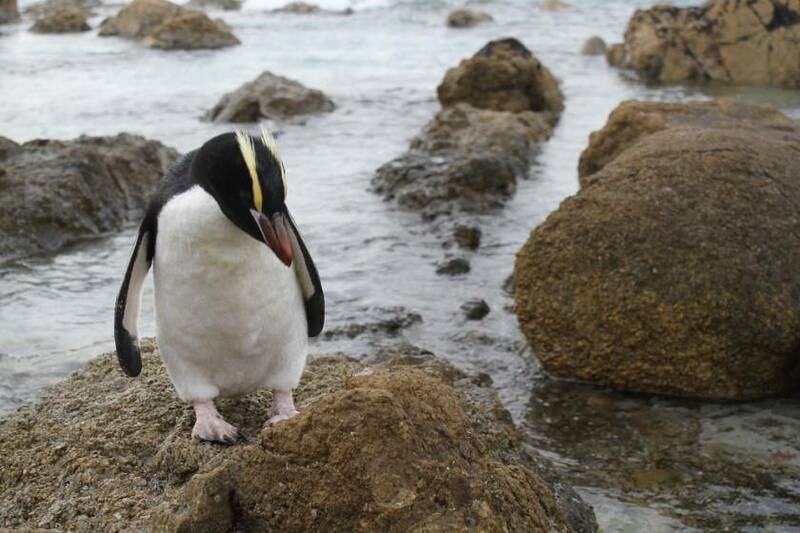 Juveniles often straggle to the east coast of the South Island, usually to moult. 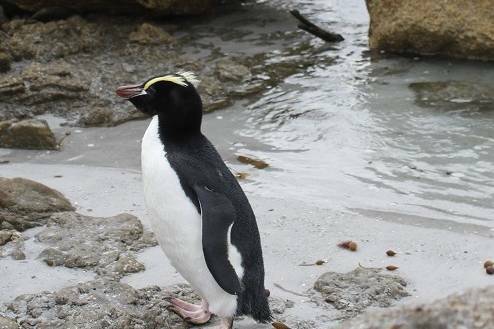 Little is known about the diet of the Fiordland crested penguin, but it is thought that they feed inshore, particularly during the breeding season. In the publicly accessible nesting sites dogs have been a cause of population decline. Elsewhere, cats, stoats and ferrets contribute to chick mortality more >>>. The population is currently estimated to be around 3,000 breeding pairs but little information is available on population trends.